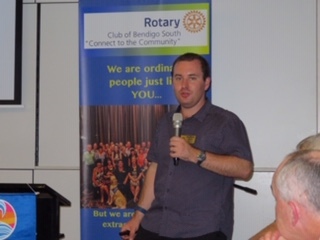 The last few weeks at the Rotary Club of Bendigo South have been quite busy and exciting. 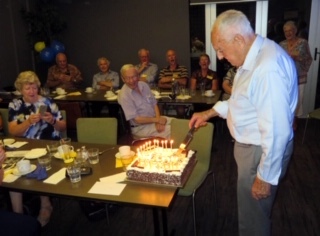 Long term Rotarian Ken Briggs celebrated his 90th birthday with Club members, friends and family. Congratulations on your long standing achievements in Rotary, Ken… We enjoy your company and involvement within the Club, as well as your wise advice. Let’s keep the good times coming! Also, Rotarian Matthew Scott last week spoke at our Club meeting of his involvement with the Cambodian Teacher Training Program in Siem Reap in January 2019. At the Siem Reap Provincial Teacher Training College, Matthew and two other teachers from Melbourne, assisted by local translators delivered teacher professional development training programs to over 90 upcoming Cambodian primary and secondary school teachers. It is hoped that this program will continue to deliver results into the future! 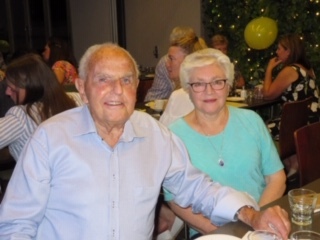 Above: Ken Briggs celebrating his 90th birthday at the Club with family and friends. Above: Member, Matthew Scott presenting to the Club about teaching in Cambodia.